When you run an online ecommerce store or in general when you are a retailer that try to compete in the ecommerce market, data intelligence is the key that could open you the way of success. In particular, know who your competitor(s) are and monitor what they do is part of a biggest strategy that can drive your ecommerce store to play at high level. 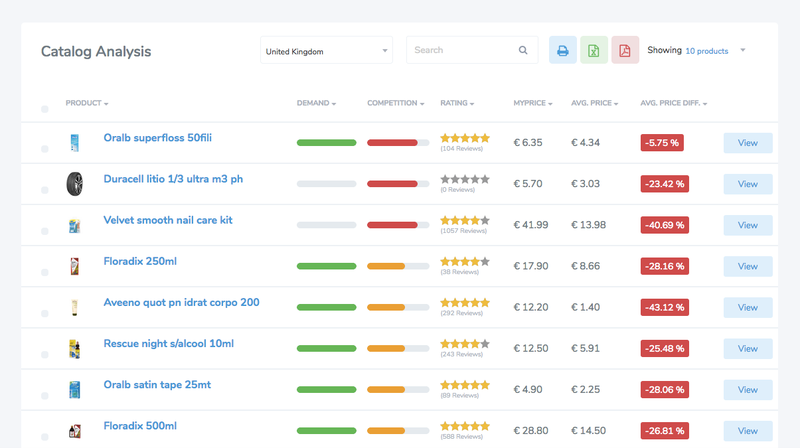 PRICEFY.IO provides you the ecommerce competitors analysis feature even with the free plan so lets see how you can use it successfully. First of all you must import your products catalog, if you don't know how to do that, check out this guide. Once your products have been imported PRICEFY.IO will start analyzing the entire web over all countries (depends on your pack level) and minute after minute your will see your products data appearing in "Catalog Analysis" section. Here you will see a column called "Competition" with multi colors bars. For each product we will analyze how many other resellers we have found online and based on our proprietary algorithm we assign a value that correspond to a color. Grey: We haven't found any other seller for that product. Red: We have found plenty of sellers. Orange: We have found numerous sellers. Yellow: We have found some sellers. Green: We have found just few sellers. One of the most common pricing and market strategy that you could apply once you know how many competitors your products have is to withdraw products offered by too many other sellers and with a low margin and focus on an high margin and low competition products pool.